The Southwest Branch of the DC Public Library system is being rebuilt/renovated. I wrote this memo last summer for some of the stakeholders. I don't know what the status is of the project. Below the memo is reprinted with a couple slight revisions. While there is no question that the DC branch library replacement construction program has created wonderful libraries across the city, at the end of the day they are still libraries but with newer facilities and separately, an expanded array of programming. Unfortunately there was never a planning process undertaken at the outset aimed at rearticulating neighborhood libraries to serve multiple goals and roles as key anchors within neighborhoods and as nodes within an integrated network of civic assets more generally, and within a sub-network of cultural facilities specifically. The replacement planning process for the Southwest Branch of the DC Public Library could result in much more than a rebuilt library, it can expand the “program” of a typical library by creating a multifunction “civic” mixed use cultural and civic public facility. This matters especially because the building that will be constructed is expected to serve the community for many generations. What is proposed is the creation of a multifaceted public library and community center, serving as the premier civic asset and community hub and anchor in Southwest DC, complementing the commercial and residential districts and other civic and cultural facilities (Waterfront Metrorail Station, DC Government buildings on 4th Street SW, cultural facilities such as Arena Stage, and the Washington Channel waterfront, and public parks, recreation centers, and schools. The concept is based on three ideas. First, libraries are the most widely used civic facilities in a community. Second, libraries tend to be the primary “cultural asset” within neighborhoods and subdistricts of a city, whether or not this function is planned for purposively. Third, one of the biggest resources that libraries (and recreation-community centers) have, at least potentially, is “flexible space” that can be programmed in a wide variety of ways to serve various community needs—but typically this space is not organized and managed in ways that allow it to be flexibly used by different types of groups and at times when normally such facilities would be closed. Referencing examples of multifaceted facilities elsewhere can infuse the process of planning such a facility in DC/Southwest DC, and allow us to rethink the planning process for neighborhood libraries generally, and specifically in terms of creating a neighborhood-centric program for the rebuilt library branch in Southwest. Below are a number of relevant examples. Idea Store, London. The Tower Hamlets borough is one of the most impoverished in London. The borough offered continuing education and workforce development programming with limited success and even though they enjoyed wide support, the libraries were old and underutilized. 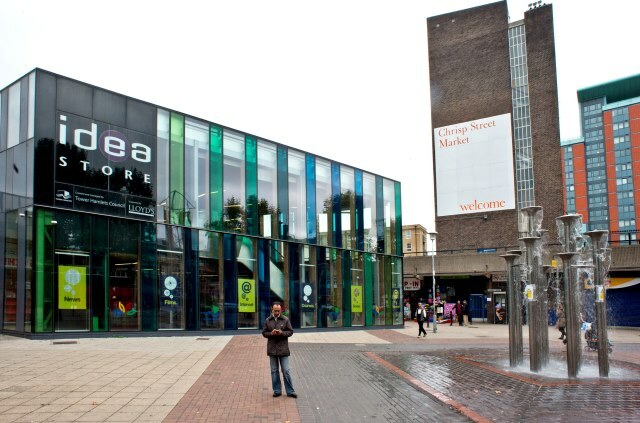 After an extensive planning process, with a special focus on reaching people who didn’t use the library, the borough came up with a new concept aimed at improving library and education services by combining them into one facility, supporting urban revitalization goals by locating the new facilities in transit-accessible commercial districts, and incorporating “involvement” principles drawn from successful retail stores as a way to engage audiences. Combined library-cultural centers, Montreal. In Montreal, cultural centers have been added to a number of borough library centers, bringing an array of facilities that wouldn’t normally be included within a library program such as auditoriums and theaters, and a range of meeting rooms capable of meeting specialized needs, such as for music. The combined library/cultural center becomes the primary “cultural facility” for the borough district, but also is part of a network of similar “library” facilities across the city, and simultaneously within the larger network of cultural facilities within the city and metropolitan area. Booksellers Alley on a Friday night. The Notre-Dame-de-Grâce Cultural Centre houses the Benny Library, an exhibition hall, as well as an indoor terrace and an outdoor yard that’s ideal for open-air cultural events. The 200-seat performance hall was designed for dance, but offers multidisciplinary programming for all age groups. The Montreal North Maison culturelle et communautaire has a performance hall with 234 seats; a rehearsal hall, a room for exhibitions; a concourse decorated with a mural by Isabelle Haveur; 16 rooms for community activities, including a recording studio and a community radio station; a day care center, and a small restaurant managed by Les Fourchettes de l'Espoir, a non-profit organization whose mission is to help and support the disadvantaged. The Pointe-aux-Trembles Library houses the Centre multimédia de l'est de Montréal, a social enterprise that aims to expand access to multimedia technologies for artist and creative as well as office and business use. Salt Lake City Central Library. While serving the entire city and more comparable to DC’s Martin Luther King Library, the Salt Lake City Central Library is perhaps the nation’s most intriguing example of rearticulating libraries as cultural facilities—as “mixed use” knowledge and cultural facilities. The old library building remains on the site, across from the new library, and is used as a museum. The arcade of the Salt Lake City Central Library. While modeled after an even larger library designed by the same architect for Vancouver, BC, the design and program for the Salt Lake Library was created through a robust planning process that engaged both librarians and other professionals alongside residents and other stakeholders. The Salt Lake central library building has inside and outside sections. 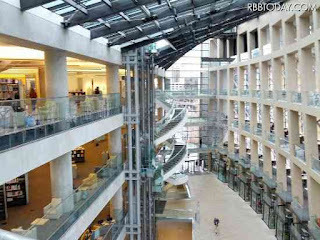 The library is on “the inside” and is organized into two sections joined by a soaring arcade, with traditional library functions on the largest side of the building. Besides many floors of materials, study tables, wifi access, and a green roof with public access, the collections side of the building includes exhibit space, an art gallery, a small café, and a specialized children’s collection. On the other side of the arcade, the upper floors are lined by tables, chairs, and study carrels, connected to the main building by walkways. On the ground floor, like “Booksellers Alley” on the back of Montreal's central library, “storefronts” house the Friends of the Library Bookstore, a craft and art gallery, café, an ATM and a rack of transit information, and one storefront bay designed to serve community uses on a temporary basis, for example, during a public master planning process, the City Department of Planning held an open studio and “office hours” in the space. A 300 seat auditorium is located below ground. Many of the floors include “fireplaces,” adding an additional placemaking element. Located in the “outside” portion of the building, which is an extension of the “arcade” side of the interior building, are the local public radio station and the Community Writing Center of the Salt Lake Community College. The radio station has an audio loop connection to the auditorium, so that meetings can be broadcasted. The Library system has begun spreading these concepts to the neighborhood branches. The Marmalade Branch of the SLC Library System includes a coffee shop and a meeting room that can be used outside of library hours because it has a separate entrance. The room has retractable stadium seating that can seat 150 people. 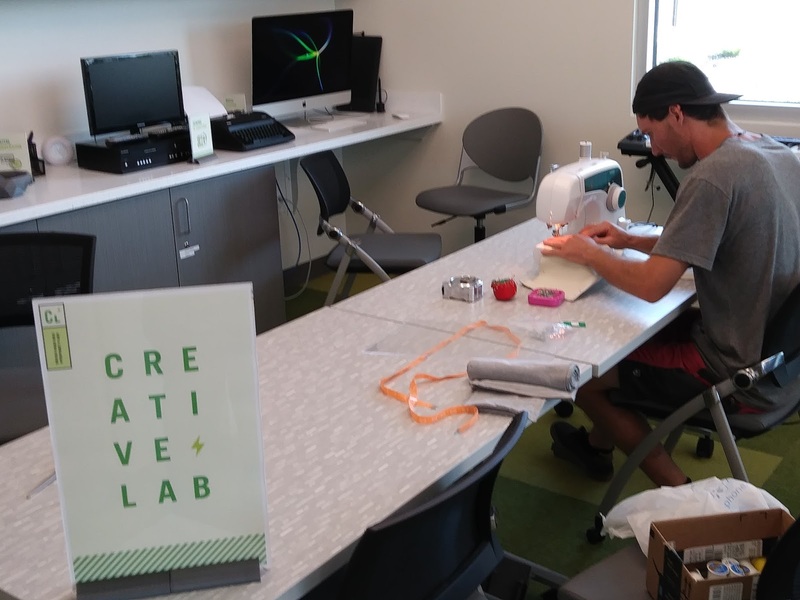 The branch also has a small maker space including digital and analog equipment such as a sewing machine. Patrons can consume coffee they've purchased on-site throughout the library branch. This branch gets more adults than other branches, and library staff opine this might be because it is the only branch library with an on-site coffee shop. Separately, library card holders can also "check out" sewing machines and other equipment. All the branch libraries have a children's area with a toy section and a "slop sink." The large meeting rooms in each branch library have a piano. The Glendale Branch has a maker space for the exclusive use of teens. The Boston Athenaeum. While a membership rather than a public library, besides having an extensive book collection including rare books, there is an art collection with more than 100,000 items, a gallery space, and an extensive public program of lectures, readings, concerts and other events. Salt Lake County Viridian Events Center. As part of the library branch in West Jordan, Utah, the Salt Lake County Library System has created an multi-function events center, a facility that can be combined as one room or divided into two or three rooms, with a maximum capacity of 700 people. Outside there is a separate amphitheater for outdoor events with a capacity of 250 people. Pounds Centre/Hampshire County, UK. Includes a library, two spaces specifically designed and programmed for teens, athletic and fitness facilities, a publicly-accessible office for the local housing authority, a café which sources food locally and has catering operations, a small publicly-accessible laundry, day care, a dental clinic, multiple counseling programs, and offices for some community organizations, and wide ranging programming. Rooms can also be rented for private and public events. Montgomery County, Maryland. The Rockville Library includes space for non-library government offices and the Center for Visual Arts, which has galleries, studio spaces, meeting rooms, and educational programs for all ages and camps for youth. Rockville is the seat of the county government and the library has an expanded special collection of government related materials. The Silver Spring Library includes space for the Levine School of Music and a small cafe. In the summer, branches in the county's conurbations, including Silver Spring and Bethesda and the City of Rockville, are open until 9 pm on Fridays and Saturdays. Shirlington Library/Arlington County, Virginia. The Shirlington Library was rebuilt to include space for the Signature Theatre, which has two black box theaters; the largest can accommodate 275-350 people. In addition to the theaters, the facility has meeting and rehearsal rooms, dressing rooms and showers, kitchens, and scene, prop, and costume shops. ImaginOn, Charlotte-Mecklenberg County, North Carolina is a joint venture with the Children's Theatre of Charlotte. It includes two theaters, a children's library and teen library, and an audio-visual studio for teen use. Drumbrae Library/West Edinburgh, Scotland. Besides the library, the facility has adult learning rooms, community meeting rooms, computers, a public housing office, an office for the local government including the community policing team, a health information center, a careers and higher education center, public computers, and an adult day care center. Athenaeum/Goucher College, Baltimore County, Maryland. The building combines the college’s main library and student activities center. Besides the campus library, the building has spaces for performances, lectures, and other events, an art gallery, the campus center for community service and multicultural affairs, fitness facilities, meeting and study spaces, and a café. Ballard Library and Neighborhood Service Center, Seattle. The Neighborhood Service Center section of the building includes office services for the city government, passport application services, Seattle Public Utilities, community courts, and meeting facilities. Hollywood Library and apartments, Portland. The four-story building houses the library branch and a café on the ground floor, with 47 mixed-income apartments on the upper stories. In London, the former Willesden Green Library in London rented space to a used bookstore. In Orange County, California, the library branch in San Juan Capistrano has a nice "Friends of the Library" bookstore. 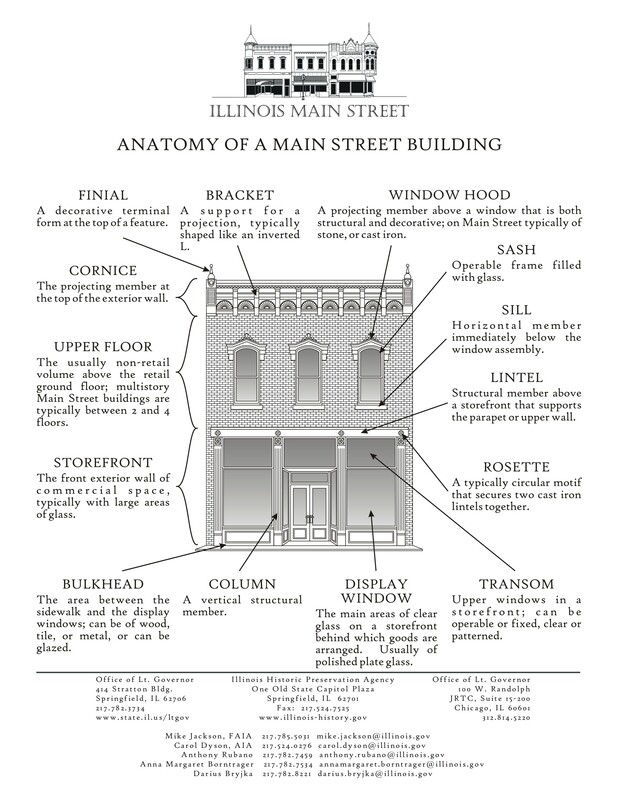 It is marketed by the city in tourism and other materials as the city's only bookstore. Local history collections. Many libraries, including DC's Georgetown branch Peabody Room, have rooms-collections devoted to local and community history. Bryant Park Reading Room, NYC. 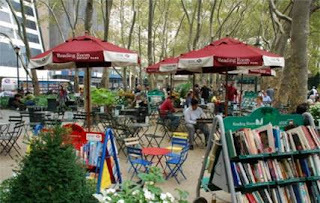 Bryant Park abuts the 42nd Street “branch” of the New York City Public Library System, which serves as the main library for NYPL system. 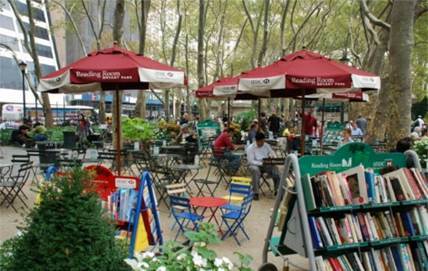 Bryant Park is managed separately by a nonprofit conservancy. One of their programs for the park is what they call “The Reading Room,” outfitted with tables, chairs, books and periodicals. Silver Spring Civic Building, Montgomery County, Maryland. Besides housing offices for the County Government, the building has meeting rooms for use by public and private groups, a gallery/exhibit space, and a large multi-use plaza for outdoor events. A portion of the outdoor plaza is dedicated to winter ice skating. The largest room can accommodate 720 people. Thomas Jefferson Community Center, Arlington County, Virginia. The community center is combined with a middle school, providing facilities that are more robust than either a community center or junior high school could offer on its own. These additional facilities include an indoor track/exposition hall, fitness facilities, art studios, and a theater-auditorium which supports a resident children’s theatre company. University of Michigan Student Unions. These facilities include space allocated on a year-to-year basis to student organizations of all sizes, complemented by permanent offices for the student government, student activities organization, and the university student housing cooperative. Western District Police Station, Baltimore. Community-serving facilities have been added to a newly renovated police station, including a community meeting room, a health and wellness clinic, a wifi hotspot, landscaped garden-open space, and public art. Chicago Cultural Center. The former Central Library has been repurposed as a cultural center serving Downtown Chicago, with an auditorium, meeting and exhibit spaces, and offices for the City Department of Cultural Affairs and the Chicago Children’s Choir. The first floor also houses the city’s primary tourism visitor center (Choose Chicago). More than 1,000 events are presented each year. The old theater housing BRIC House includes a separate facility for the Urban Glass studios. 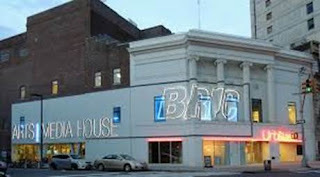 Brooklyn Information and Culture/BRIC House. BRIC is a nonprofit media and arts organization serving Brooklyn, including running the borough's community access cable television service. It supports a wide variety of cultural programming across the borough, including free concerts at Prospect Park, a calendar of events, etc. In 2013, it opened an arts center called BRIC House in a previously vacant theater, showing films and presenting lectures and readings, complemented by a gallery and a flexible performance space. BRIC has a studio residency program for working artists, and offers classes in photography and video production. BRIC House’s upper stories are home to a separate arts organization, the Urban Glass studios and education program in artistic glass production. As part of its operation of Brooklyn’s Public Access Cable Television channel, BRIC partners with the Brooklyn Library system, and offers classes in media production at a number of branches. The Coney Island branch library is outfitted with a television studio on the second floor, run by BRIC, and residents who have been trained through BRIC classes can rent/check out video production equipment ("Library unveils new television studio at Coney branch," Courier Life). Creative Alliance at the Patterson, Baltimore. Located in the Highlandtown Arts District, the Creative Alliance has restored the old Patterson Theater which continues on as a venue for movies, performing arts, and presentations. Two art galleries present more than 20 shows annually, and is complemented by workshops, an artist in residence program, a community outreach program, and after school arts programs serving more than 2,000 students each year. Town Hall Education Arts Recreation Campus, Ward 7, Washington, DC. This is a broad ranging facility including cultural, health, recreation, and education elements and space for organizations ("On Mississippi Ave. SE, a place of light and learning" and "New $34 million community center building coming to Southeast," Washington Post). 92nd Street Y, New York City. The organization serves more than 300,000 people each year through early education, fitness, and cultural programs, including music and dance performances, a widely publicized lecture series, readings, and films, arts education including studios and workshop spaces, adult education, as well as early childhood and parental education, and a senior center. Mestizo Coffeehouse and Gallery, Salt Lake City. This nonprofit coffeehouse and art gallery also serves as a presentation space, and offers free use of meeting spaces to community nonprofits. Busboys and Poets restaurants, Washington, DC. These restaurants typically have a meeting space suitable for lectures and private meetings, restaurant space, coffee house/bar spaces, and small bookstores, run by the area bookstore, Politics and Prose. Regional chapter facilities for the American Institute of Architects. AIA chapters in large cities typically have multiuse facilities with exhibit halls, meeting rooms for lectures and presentations, an architecture and design bookstore, as well as chapter offices, sometimes a library, etc. Skyline Bistro, Worcester Technical High School, Worcester, Massachusetts. This restaurant is open to the public and is run by students in the culinary and hospitality technical education programs. Colors Restaurant, Restaurant Opportunities Center. The restaurant workers labor and training organization runs restaurants in New York City and Detroit that serve as training sites for people being trained in culinary, bartending, and fine dining/table waiting programs. An event at Red Emma's, a key anchor in Baltimore's Station North Arts District. Red Emma’s Bookstore, Baltimore. The bookstore is organized as a business cooperative, and a café is managed and owned separately but shares the space. They are connected by a large open space set up with tables and chairs. This section serves as café, free-form “sitting space”—no purchase required, and meeting room, reconfigured for lectures, author talks, and community meetings. Considering the various model mixed use facilities outlined above, I propose that the rebuilt Southwest Library incorporate an expanded cultural-, civic-, and community-focused program. To support retail development and entrepreneurship objectives, the “Community Hub” could have a set up where the café supports entrepreneurship development and could have pop up restaurant functions at night. Alternatively, a café could be run as an education-social entrepreneurship program in association with area hospitality/culinary training programs, perhaps with the Restaurant Opportunities Center, which has expressed interest in opening a training branch in DC. 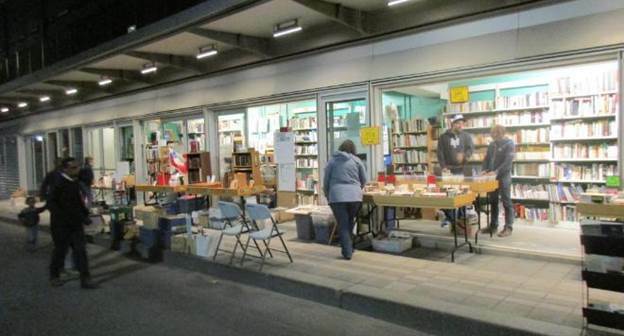 A small bookstore could be included in the building footprint—the Biblioteque National de Quebec in Montreal has bookseller stalls on the backside of the library. 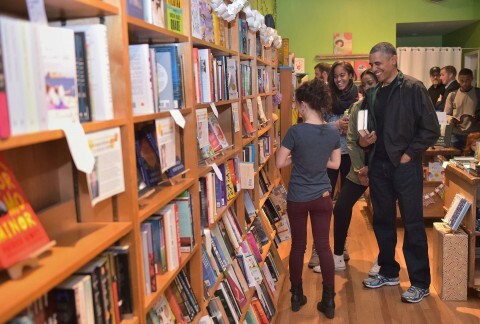 Upshur Street Books with President Obama and his daughters Malia and Sasha. Currently there is a resurgence in the development of small bookstores ("The novel resurgence of independent bookstores," Christian Science Monitor), as for profit businesses and community hubs, including at least one in DC, Upshur Street Books ("Bookstore celebrates opening in DC," Washington Post) in Petworth, which is notable for having received a visit from President Obama and his daughters. The Swiss Institute's new building on St. Marks will include Printed Matter. Printed Matter, the bookstore in Chelsea in New York City that specializes in artists' books, will open a second store, in the Swiss Institute's new space on St. Marks Place and Second Avenue, on June 21, ARTnews reported. Called Printed Matter/St. Mark's, the new store will carry "artists' books, prints, posters, and the like, as well as offerings from the Swiss Institute's publishing imprint," ARTnews wrote. Printed Matter executive director Max Schumann said the new store "presents an amazing opportunity to bring the creative, experimental, and critical work being done in the field of artists' publications to a broader audience, which is at the heart of Printed Matter's mission." Founded in 1976, Printed Matter is a nonprofit organization "dedicated to the dissemination and appreciation of artists' books." It offers talks, workshops and other events, which it plans to do in the new location as well. The Swiss Institute's new 7,500-square-foot building includes space for exhibitions, projects and public programs, a library, the Printed Matter bookstore and a rooftop garden. 2. The New York Times reported on the forthcoming of the Fiction Center in Brooklyn. A New York City nonprofit that says it is dedicated to the art of fiction will open its new home in Brooklyn next January. The Center for Fiction says the three-story facility will include a bookstore, a cafe, a library, classrooms and a 160-seat auditorium. The New York Times reports construction on the facility began in late April. The Center for Fiction was originally established in 1820 as the Mercantile Library. It renamed itself the Center for Fiction in 2008, and later sold its old headquarters in midtown Manhattan. The new facility will be jointly owned with the Mark Morris Dance Group and the real estate development company BCD.